Pinkadots Elementary : Saturday Spark Motivation: Scanning work to send to parents! Saturday Spark Motivation: Scanning work to send to parents! I'm linking up with my BBB Joanne over at Head Over Heels for Teaching for Spark Motivation Saturday for a quick post. One of my favorite subjects to teach is Writing and I really try to convey that to my students to make them understand that writing can be fun. At the beginning of the year, I always have my new students complete a student interest survey. They rank their subjects in school from favorite to most dreaded. Writing is always either at the top or bottom of everyone's list, students either love it or hate it. I make it my goal to make the results of my end of the year survey with 100% of students to NOT put writing on the bottom of their list. I love making writing fun for the students because honestly, I don't want to read boring essays that lack personality, motivation, and enthusiasm. If you have been following my blog, you know we were working on finishing up opinion writing this week. 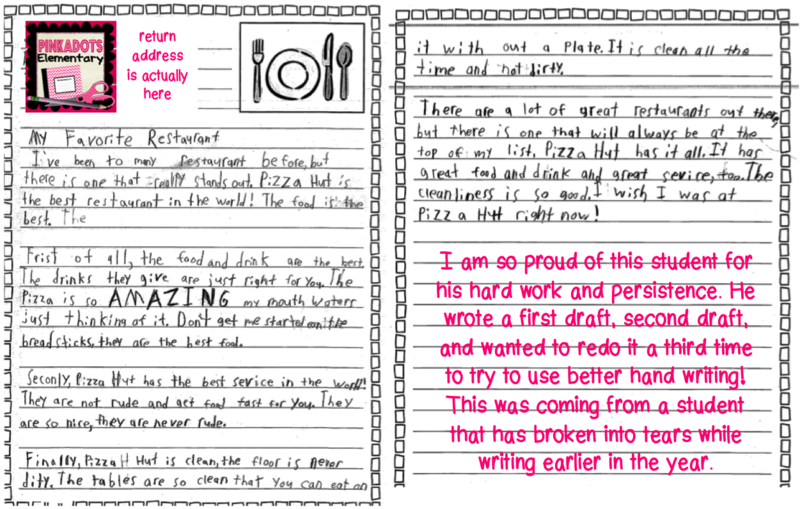 We finished our "My Favorite Restaurant" essays in one class and are sending them out on Monday (the kids are hoping for a letter/gift card/coupon back- haha). One of my sweet little boys, that does not have ANY interest in reading OR writing, worked his little tail off this week. He loves food and when he is involved in a conversation about pizza, his face lights up. When he found out he was allowed to write an opinion piece about his favorite restaurant and was actually going to send the restaurant the essay, that was the motivation he needed to start writing. At the beginning of the year, this little guy would erase his letters over and over and not make it past a few choppy sentences before bursting into tears. Check out his essay now! Seriously, he wrote this THREE times before he was happy with it. Is it perfect? No, but it is amazing for him and I sure let him know it. I told him that I was so proud of him, I scanned it and emailed it to his mother with an awesome note! He had a huge smile on his face, as he high fived me and said, "Maybe she will let us order from Pizza Hut tonight!?" Our amazing new copy machines scan papers and email them to anyone. It's perfect to email worksheets to myself to project on the Smart Board, but now I just realized (duh!) I can send home student work super fast! I actually keep a lot of writing examples and paper throughout the year, so parents don't get to see EVERYTHING. This is a great way to keep certain parents informed of progress. What a great idea to email the parents some of the student's work. Parents will be appreciative of it. This is so great! I really dislike Pizza Hut, but this little boy has me rethinking! Great job dude! Such a great idea! Your student did such a great job and showed great progress. I also like the idea of having students rank their favorite subjects at the beginning of the year and then again at the end of the year. This would be a great reflection tool as well. Thanks for sharing! I love this idea! I'm going to try to implement this after state testing. I still think a copy machine that can email is the coolest thing ever! I really want to beg my PTO for one! Lol! Love the Pizza Hut writing. Kudos to your guy who wrote this! I am so excited to start my students on their restaurant letters this week! What a great idea! I love the paper that you used for the final copy.....is this available in your TpT store?